Elizabeth Kimberly Tweddle MBE (born 1 April 1985) is a retired British artistic gymnast. She was the first female gymnast from Great Britain to win a medal at the European Championships, World Championships, and Olympic Games. Tweddle represented Great Britain at three Olympic Games. She is the 2012 Olympic bronze medalist on uneven bars, the 2006 and 2010 World Champion on the uneven bars and the 2009 World Champion on floor exercise. Tweddle retired in August 2013. Following retirement, Tweddle's profile allowed her to take on a variety of media and sporting work. On 10 March 2013, Tweddle won the eighth series of Dancing on Ice along with partner Daniel Whiston, who won the show for the third time. In 2014, she took part in the ninth and last series of Dancing on Ice, the "All-Stars" series, with new skating partner Łukasz Różycki, making the final and coming third. In 2016, Tweddle participated in the third series of Channel 4 reality contest show The Jump. However, on February 7, two weeks into the show, Tweddle suffered a back injury and was forced to withdraw from the competition. It was reported on 8 February 2016 that she had successfully undergone neck surgery to fuse two vertebrae together using a piece of her hip bone. Tweddle was born on 1 April 1985 in Johannesburg, South Africa and moved with her family to Bunbury, Cheshire, England when she was 18 months old. After trying several different sports, Tweddle began competing in gymnastics at the age of seven at Crewe and Nantwich Gymnastics Club. In 1997, she moved to the City of Liverpool Gymnastics Club to train with coach, Amanda Reddin. Tweddle attended The Queen's School, Chester and completed a foundation degree with the University of Liverpool. In 2007, she graduated from Liverpool John Moores University with a degree in Sports Science. She has been accepted to the University of Liverpool's physiotheraphy programme and began to attend after the 2012 Summer Olympics. Tweddle is also involved with Total Gymnastics. She said, "I have a sports science degree, and I'll be continuing my studies in the future – I have place at the University of Liverpool to study Physiotherapy in 2012. I've also started Total Gymnastics with the help of former Olympic swimmer Steve Parry. We go into schools and leisure centres to help give children a chance to try gymnastics – which I'm enjoying because so many gymnastics clubs are overbooked.". Tweddle is a keen Football fan and is a supporter of Conference Premier team Chester F.C.. She is also a patron of Alder Hey Children's Hospital charity. At the end of October, Tweddle competed at the World Championships in Ghent, Belgium. She helped the British team place ninth and individually she placed twenty-fourth in the all around final with a score of 34.892. In April, Tweddle competed at the European Championships in Patras, Greece. She helped the British team place sixth and individually she placed fourteenth in the all around final with a score of 34.242. In event finals, she placed third on uneven bars with a score of 9.287. This was the first medal ever won by a female British gymnast at the European Championships. Tweddle said, "When I saw my name on the scoreboard in third place I just started to cry and couldn't stop. I'm just so happy." In July, Tweddle competed for England at the 2002 Commonwealth Games in Manchester, United Kingdom. She placed second in the all around final with a score of 36.387. In event finals, she placed seventh on vault scoring 8.887 and first on uneven bars scoring 9.550. In November, Tweddle competed at the World Championships in Debrecen, Hungary. She placed fourth on uneven bars scoring 9.312. In August, Tweddle competed at the World Championships in Anaheim, United States. She placed third in the uneven bars final with a score of 9.512. In October, Tweddle competed at the World Cup event in Glasgow, United Kingdom. She placed first on uneven bars scoring 9.450 and third on balance beam scoring 8.800. In November, Tweddle competed at the World Cup event in Stuttgart, Germany. She placed second on uneven bars with a score of 9.475. In March, Tweddle competed at the World Cup event in Cottbus, Germany. She placed first on uneven bars scoring 9.587. Later in March, Tweddle competed at the World Cup event in Lyon, France. She placed first on uneven bars with a score of 9.500. In April, Tweddle competed at the European Championships in Amsterdam, The Netherlands. She placed eleventh in the all around final with a score of 35.124 and second in the uneven bars final with a score of 9.587. In August, Tweddle competed at the 2004 Summer Olympics in Athens, Greece. She contributed an all around score of 36.912 toward the British team's eleventh-place finish. In the all around final, Tweddle placed nineteenth with a score of 35.761. In February, Tweddle competed at the World Cup event in New York City, United States. She placed fourth on uneven bars scoring 9.487 and third on floor scoring 9.412. In May, Tweddle competed at the World Cup event in Paris, France. She placed second on uneven bars scoring 9.450 and seventh on floor scoring 8.225. In October, Tweddle competed at the World Cup event in Glasgow, United Kingdom. She placed first on uneven bars scoring 9.687, third on balance beam scoring 9.012, and first on floor scoring 9.475. In November, Tweddle competed at the World Championships in Melbourne, Australia. She placed fourth in the all around final with a score of 36.936 and third in the uneven bars final with a score of 9.575. In March, Tweddle injured her right ankle and was unable to compete in the 2006 Commonwealth Games. She said, "It's a big disappointment as I was looking forward to the Games but as team captain I'll stay in Melbourne and cheer the team on. It will be difficult watching but I'll have to put the injury behind me now. We were doing podium training when I landed badly after a vault. I knew straight away that something was wrong. The injury is not too severe it is a bruised bone and the doctors have said I will be back in time for the Europeans in April. In the back of my mind I was still hoping to do bars but the doctors advised me to leave it if I wanted to be fit for the Europeans. The Beijing Olympics are still in the back of my mind but I've still not decided whether I will carry on yet." In April, Tweddle competed at the European Championships in Volos, Greece. She won the uneven bars final with a score of 16.050. Her victory was the first at a European Championships for a British gymnast. In July, Tweddle competed at the British Championships in Guildford, United Kingdom. She won the all around competition with a score of 60.750. In event finals, she placed first on uneven bars scoring 15.850, first on balance beam scoring 14.850, and first on floor scoring 15.350. In October, Tweddle competed at the World Championships in Aarhus, Denmark. She placed eighth in the all around final with a score of 59.450. In event finals, she placed first on uneven bars scoring 16.200 and fourth on floor scoring 15.425. Her gold medal was the first Britain ever earned at a World Championships. Tweddle said, "I knew that I could do the routine, it was just whether I could pull it out for that moment. I went into the gym on Friday morning and did exactly the same routine as I would do that night. I went through first time and that brought my confidence back up again, and my coach knew that from then on she just had to keep me calm and let me get on with it. All my hard work has finally paid off and I'm absolutely ecstatic. A lot of people told me it would come, but I didn't think it ever actually would. It hasn't sunk in yet. I've had the bronze medal at the last two world championships and to come out today after the fall yesterday and get through it is an achievement. I didn't know if I'd win because I hadn't seen Liukin's routine, but I've seen her in training and she was pretty spectacular." In November, Tweddle competed at the World Cup event in Glasgow, United Kingdom. She placed first on uneven bars scoring 16.025 and seventh on floor scoring 14.550. In December, Tweddle competed at the World Cup final in São Paulo, Brazil. She placed first on uneven bars scoring 16.300 and second on floor scoring 15.200. At the end of the year, Tweddle was nominated for, and finished in third place, for the 2006 BBC Sports Personality of the Year, the only British gymnast ever to make the short list for the award. In January, Tweddle had surgery on her shoulder. In April, she competed at the European Championships in Amsterdam, The Netherlands. She placed second in the floor final with score of 15.250. Tweddle said, "It was quite hard, but it was a case of not competing at Europeans, or do a couple of events and getting back on the international stage again. Obviously, later in the year is more important than this. It wasn't worth pushing the injury, which could make it worse for later in the year." In July, Tweddle competed at the British Championships in Guildford, United Kingdom. She won the all around competition for the seventh straight time with a score of 59.750. In event finals, she placed first on uneven bars scoring 16.350. Tweddle said, "It's a bit spooky to win my seventh title on the seventh of the seventh 2007. I was really happy with how things went today. I made the decision to alter my second floor tumble just to help my foot and make sure I didn't injure it before the Worlds, but everything else was fine." In September, Tweddle competed at the World Championships in Stuttgart, Germany. She contributed an uneven bars score of 14.175 toward the British team's seventh-place finish, meaning that they qualified a full team to the Olympics. In event finals, she placed fourth on uneven bars scoring 16.125 and seventh on floor scoring 14.900. In November, Tweddle competed at the World Cup event in Glasgow, United Kingdom. She placed seventh on uneven bars scoring 14.025 and first on floor scoring 14.550. Tweddle said, "I went for broke with my bars routine as I wasn't happy with my qualifying routine. I know that I would have to be perfect if I want to get gold at the Olympics next year." In April 2008, Tweddle competed at the European Championships in Clermont-Ferrand, France. She contributed a score of 16.075 on uneven bars toward the British team's sixth-place finish. In event finals, she placed fourth on uneven bars scoring 15.475 and second on floor scoring 15.525. In June, Tweddle competed at the British Championships in Guildford, United Kingdom. She placed second on uneven bars with a score of 14.550 and was unable to compete on any other apparatus due to an ankle injury. She said, "I've only been able to train on the bars for the past couple of weeks so I've had to do a lot of visualisation with the other apparatus. But hopefully this week I'll be able to train on the floor, beam and vault. I've had a few ankle injuries before so it's just a case of having physio, doing lots of exercises and just keeping on top of it. It's just a case of working with it and looking after it." Afterwards, Tweddle was selected to compete for the United Kingdom at the 2008 Summer Olympics. She said, "I'm really excited and just looking forward to getting there and doing the best job I can." In August, Tweddle competed at the 2008 Summer Olympics in Beijing, China. She contributed scores of 15.650 on uneven bars and 14.950 on floor toward the British team's ninth-place finish. In the uneven bars final, she placed fourth with a score of 16.625. Tweddle said, "I'm going to continue, I don't see myself quitting now, although I will have some time off. I was pleased just to be in the final. My dismount is normally not a problem but I just didn't get enough height and to be honest I thought I was going to end up on my face. My dream has been to be in the final. Now I'll have to leave it to London in 2012 to get a medal. I came into this final in last place, so I just had to go out there and do it and I am pleased with my performance. It was a good result, I am not disappointed with fourth." After the Beijing Olympics, Tweddle decide to contentrate her training on uneven bars and floor. She said, "I thought I would retire this year but then I was so close in Beijing that there is still some unfinished business. Now I don't really know when I'll stop. To be honest 2012 is in my sights now which it wasn't this time last year. We will just have to see how my body holds up but that's the goal. As long as I'm still enjoying it and still up there challenging then I'll keep going. I want to try to prove everyone wrong and get that Olympic medal. I've been working closely with both my coach and my physio to keep my body going. My training has changed a lot and I only do bars and floor seriously now. Beam and vault are the ones which hurt my feet and I can't really upgrade enough to be up there to contend for the all around anymore. I've also changed my training partner and now I train with Hannah Whelan. The variety has given me a new lease of life." In April, Tweddle competed at the European Championships in Milan, Italy. In event finals, she placed first on uneven bars scoring 15.575 and first on floor scoring 15.150. Tweddle said, "It is nice to be back. Since 2006 I have had my share of fourth positions, and all week I have been so focused on getting everything right. I was a touch short on the Tkatchev-half, and I think it was pure determination that got me through." In May, Tweddle competed at the World Cup event in Glasgow, United Kingdom. She placed first on uneven bars scoring 15.275 and first on floor scoring 14.900. Later in May, Tweddle participated at the British Teams competition in Guildford, United Kingdom. She contributed scores of 15.700 on uneven bars and 15.450 on floor toward her club, City of Liverpool's, first-place finish. In October, Tweddle competed at the World Championships in London, United Kingdom. She won the floor final with a score of 14.650. Tweddle said, "I was renowned for bars. This is my first medal in floor and it's the best feeling ever." In April 2010, Tweddle competed at the World Cup event in Paris, France. She placed second on uneven bars scoring 15.650 and first on floor scoring 15.025. In May, Tweddle competed at the European Championships in Birmingham, United Kingdom. She contributed scores of 15.850 on uneven bars and 14.925 on floor toward the British team's second-place finish. In event finals, she placed first on uneven bars scoring 15.875 and first on floor scoring 14.825. In July, Tweddle competed at the British Championships in Guildford, United Kingdom. She placed first on uneven bars with a score of 15.000. In October, Tweddle competed at the World Championships in Rotterdam, The Netherlands. She contributed scores of 15.733 on uneven bars and 14.666 on floor toward the British team's seventh-place finish. In event finals, she placed first on uneven bars with a score of 15.733. Tweddle said, "It means everything to me to regain the bars title. I have worked so hard day in day out in the gym for this so I'm very proud. I wasn't watching the previous routines but from the noise of the crowd I could tell the two Chinese girls ahead of me had fallen and so I tried to remain calm, but knew at that point that if I went clean I had a great chance of winning the title." Tweddle was appointed Member of the Order of the British Empire (MBE) in the 2010 New Year Honours. She said, "It's been totally surreal to get an MBE. I didn't really believe it at first. I waited for the letter telling me I was coming to the palace before I did. I was surprisingly quite nervous before the ceremony – I was worried about tripping up when I walked in. Everyone kept saying to me 'you are not going to cartwheel in'. I train to win gymnastic medals but away from gymnastics the MBE is a massive honour." In April, Tweddle competed at the European Championships in Berlin, Germany despite having an injured shin. In event finals, she placed first on uneven bars scoring 15.100 and fourth on floor scoring 14.300. In May, Tweddle participated in the British Team Championships in Guildford, United Kingdom. She contributed scores of 14.900 on uneven bars and 14.300 on floor toward her club, City of Liverpool's, first-place finish. In July, Tweddle competed at the British Championships in Liverpool, United Kingdom. She placed first on uneven bars scoring 15.200 and first on floor scoring 15.250. In October, Tweddle competed at the World Championships in Tokyo, Japan. She contributed scores of 15.666 on uneven bars and 14.533 on floor toward the British team's fifth-place finish. This was the team's highest placement ever and qualified a full team for the Olympics. In the floor final, Tweddle placed seventh with a score of 14.500. She said, "The week has been a great success as we achieved our number one aim and we've got the British women's team qualified for 2012 so that's now the focus." In March, Tweddle competed at the World Cup event in Doha, Qatar. She won the uneven bars final with a score of 15.175. In April, Tweddle had keyhole surgery on her knee and was unable to compete at the European Championships in May. She said, "I'm disappointed not to be in a position to attend the European's but also thankful that this gives me the opportunity to get myself fully fit and ready for the rest of the season, certainly it's much better for this process to happen now rather than later in the year! I am very much still in the gym every day and will continue to work alongside the British Gymnastics medical team to ensure I manage my recovery. The line-up for the European Championship demonstrates the strength in depth that we have, and I'm sure the girls will do a great job in Brussels." In June, Tweddle competed at the British Championships in Liverpool, United Kingdom. She won the uneven bars final with a score of 15.850. At the beginning of July, Tweddle was selected to compete for the United Kingdom at the 2012 Summer Olympics. She said, "It is of course a massive honour to be selected to Team GB for the Olympic Games. This is my third Olympics and with it being on home soil it's definitely the most special. The build-up has been totally different and you really feel the support of the whole country. Everyone knows everything about the Games this year and people are really interested in all the events and all the team members. From Beijing to here has been a long journey. After 2008 I wasn't even sure I would carry on, but the huge support for London and the enthusiasm of the public has really motivated me and inspired me to carry on training hard. Everything about competing in the Olympic Games is exciting, the moment you get the official letter, the kitting out, the multi-sport atmosphere, it's all a huge honour to be a part of and I can't wait." At the end of July, Tweddle competed at the 2012 Summer Olympics in London, United Kingdom. In the team final, Tweddle contributed scores of 15.833 on uneven bars and 14.166 on floor toward the British team's sixth-place finish. In the uneven bars final, Tweddle won the bronze medal with a score of 15.916. She said, "It's the best feeling in the world to win the bronze medal, there was one point today I thought I'd end in 4th like in Beijing 08, so I'm really happy. This was the one medal missing from my collection; this is the one I really wanted. I tried to keep calm and do what I do best and the crowd were amazing, as soon as I walked into the arena it was incredible. I haven't made any future plans yet, I definitely won't be in Rio but I'm happy to go home now and have a bit of a holiday and get back into the gym; if my heart's in it I will continue. I had a step on my dismount but at the end of the day I had to go for the difficult dismount to challenge for a medal. To be honest I could say 'what if' but I'm not disappointed in the slightest, any medal, any colour is what I always said I wanted, so I'm extremely happy." Results as per Tweddle's official competition record at the International Gymnastics Federation athlete profile page. In 2012 Tweddle was one of five Olympians chosen as part of a series of body-casting artworks by Louise Giblin exhibited in London and copies being sold in aid of the charity Headfirst. ^ a b "Elizabeth Tweddle". British Olympic Association. Retrieved 15 July 2014. ^ "Olympic medallist Beth Tweddle announces retirement". BBC Sport. 6 August 2013. Retrieved 6 August 2013. ^ "The Jump 2016: Get the FULL lineup of brave celebs here". 16 January 2016. ^ "Beth Tweddle thanks fans for their support after breaking her back". ^ "Beth Tweddle airlifted to hospital after accident on The Jump". 7 February 2016. ^ "The Jump 2016: Ski crash ruins Beth Tweddle's back and she's airlifted to hospital for operation". 7 February 2016. ^ "BBC Sport – 100 Team GB contenders for London 2012: Beth Tweddle". Bbc.co.uk. 26 July 2011. Retrieved 1 September 2012. ^ "Beth Tweddle – Team GB – London 2012 Olympics". Telegraph. Retrieved 1 September 2012. ^ Wheelock, Paul (6 August 2012). "Olympics 2012: Beth Tweddle aiming to end glorious career with London Games gold". Chester Chronicle. ^ University of Liverpool Insight – 2012 edition. 2012. p. 2. ^ "About". Total Gymnastics. Retrieved 25 August 2012. ^ Eurosport. "London 2012 – Beth Tweddle Q & A – Yahoo! Eurosport". Uk.eurosport.yahoo.com. Retrieved 1 September 2012. ^ Charity, Alder Hey Children's. "Our Patrons". ^ "Events :: Show". Fig.lx2.sportcentric.com. 4 November 2001. Archived from the original on 3 August 2012. Retrieved 30 August 2012. ^ "24th European Women's Artistic Gymnastics Championships Results" (PDF). Patras, Greece: European Union of Gymnastics. 19 April 2002. Retrieved 28 August 2012. ^ "2002 Artistic Gymnastics World Championships, Women's Finals". Gymnasticsresults.com. 4 December 2003. Retrieved 30 August 2012. ^ "Events :: Show". Fig.lx2.sportcentric.com. 24 August 2003. Archived from the original on 7 August 2012. Retrieved 30 August 2012. ^ "Events :: Show". Fig.lx2.sportcentric.com. 26 October 2003. Archived from the original on 3 August 2012. Retrieved 30 August 2012. ^ "Events :: Show". Fig.lx2.sportcentric.com. 30 November 2003. Archived from the original on 6 August 2012. Retrieved 30 August 2012. ^ "Cottbus World Cup Results". Fédération Internationale de Gymnastique. 7 March 2004. Archived from the original on 28 July 2013. Retrieved 28 August 2012. ^ "Lyon World Cup Results". Fédération Internationale de Gymnastique. 14 March 2004. Archived from the original on 28 July 2013. Retrieved 28 August 2012. ^ "European Artistic Gymnastics Championships Results". Fédération Internationale de Gymnastique. 2 May 2004. Archived from the original on 6 August 2012. Retrieved 28 August 2012. ^ "Events :: Show". Fig.lx2.sportcentric.com. 29 August 2004. Archived from the original on 3 August 2012. Retrieved 30 August 2012. ^ "American Cup Event Finals Results" (PDF). New York City, United States: USA Gymnastics. 26 February 2006. Retrieved 30 August 2012. ^ "14th French International Paris – Women's Artistic Gymnastics". Gymnasticsresults.com. Retrieved 1 September 2012. ^ "Glasgow Grand Prix 2005 Artistic Gymnastics". Gymnasticsresults.com. 23 October 2005. Retrieved 1 September 2012. ^ "38th Artistic Gymnastics World Championships Melbourne (AUS)". Gymnasticsresults.com. Retrieved 30 August 2012. ^ Sarah Holt (15 March 2006). "Injury forces Tweddle to pull out". BBC Sport. Retrieved 1 January 2010. ^ "26th Women's European Championships Artistic Gymnastics Results" (PDF). Volos, Greece: European Union of Gymnastics. 30 April 2006. Retrieved 28 August 2012. ^ "2006 British Women's Artistic Gymnastics Championships Guildford". Gymnasticsresults.com. 9 July 2006. Retrieved 30 August 2012. ^ "30th Women's Artistic Gymnastics World Championships Aarhus (DEN)". Gymnasticsresults.com. 30 December 2005. Archived from the original on 26 November 2012. Retrieved 30 August 2012. ^ "Super Tweddle wins landmark gold". BBC Sport. 20 October 2006. Retrieved 1 January 2010. ^ "Events :: Show". Fig.lx2.sportcentric.com. 12 November 2006. Archived from the original on 12 March 2012. Retrieved 30 August 2012. ^ "Sao Paulo World Cup Final Results". Fig.lx2.sportcentric.com. 17 December 2006. Archived from the original on 27 May 2012. Retrieved 28 August 2012. ^ "Sports Personality contenders". BBC Sport. 4 December 2006. Retrieved 1 January 2010. ^ a b "International Gymnast Magazine Online – Ferrari Leads Qualifying at Europeans". Intlgymnast.com. 25 April 2007. Retrieved 30 August 2012. ^ "2nd European Artistic Gymnastics Individual Championships" (PDF). Amsterdam, The Netherlands: Fédération Internationale de Gymnastique. 29 April 2007. Retrieved 28 August 2012. ^ "International Gymnast Magazine Online – Tweddle Takes Lucky Number Seven". Intlgymnast.com. 8 July 2007. Retrieved 30 August 2012. ^ "Events :: Show". Fig.lx2.sportcentric.com. 9 September 2007. Archived from the original on 28 July 2012. Retrieved 30 August 2012. ^ "Glasgow World Cup Results". Fédération Internationale de Gymnastique. 11 November 2007. Archived from the original on 15 August 2012. Retrieved 28 August 2012. ^ "International Gymnast Magazine Online – British Women, Dutch Men Golden in Glasgow". Intlgymnast.com. 10 November 2007. Retrieved 30 August 2012. ^ "27th European Women's Artistic Gymnastics Championships Results" (PDF). Clermont-Ferrand, France: European Union of Gymnastics. 6 April 2008. Retrieved 28 August 2012. ^ "Tweddle to miss GB Championships". BBC Sport Olympics. 24 June 2008. Retrieved 1 January 2010. ^ "Tweddle and Downie lead GB team". BBC Sport Olympics. 29 June 2008. Retrieved 1 January 2010. ^ "Gymnastics Artistic Women's Qualification Results" (PDF). Beijing, China: Fédération Internationale de Gymnastique. 10 August 2008. Archived from the original (PDF) on 28 July 2013. Retrieved 28 August 2012. ^ "Gymnastics Artistic Women's Event Finals Results" (PDF). Beijing, China: Fédération Internationale de Gymnastique. 17 August 2008. Archived from the original (PDF) on 28 July 2013. Retrieved 28 August 2012. ^ "China win as Tweddle misses out". BBC Sport. 18 August 2008. Retrieved 18 August 2008. ^ James Pearce. "Sport – Other Sports – Retirement plans on hold as Liverpool's Beth Tweddle eyes dream 2012 finale". Liverpool Echo. Retrieved 11 March 2013. ^ "International Gymnast Magazine Online – Tweddle Reclaims Uneven Bars Title". Intlgymnast.com. 5 April 2009. Retrieved 30 August 2012. ^ "Glasgow World Cup Uneven Bars Final Results" (PDF). Glasgow, United Kingdom: Fédération Internationale de Gymnastique. 16 May 2009. Retrieved 28 August 2012. ^ "Glasgow World Cup Floor Final Results" (PDF). Glasgow, United Kingdom: Fédération Internationale de Gymnastique. 16 May 2009. Retrieved 28 August 2012. ^ "British Teams Results" (PDF). Guildford, United Kingdom: British Gymnastics. 24 May 2009. Retrieved 28 August 2012. ^ "Events :: Show". Fig.lx2.sportcentric.com. Archived from the original on 26 September 2012. Retrieved 30 August 2012. ^ "Tweddle claims superb World gold". BBC News. 18 October 2009. Retrieved 26 April 2010. ^ "Paris World Cup Results". Fédération Internationale de Gymnastique. Archived from the original on 15 February 2013. Retrieved 28 August 2012. ^ "28th European Artistic Gymnastics Championships Results" (PDF). Birmingham, United Kingdom: Fédération Internationale de Gymnastique. 2 May 2010. Retrieved 28 August 2012. ^ "British Championships Results" (PDF). Guildford, United Kingdom: British Gymnastics. 4 July 2010. Retrieved 28 August 2012. ^ "2010 Artistic Gymnastics World Championships – Apparatus Finals, day one". British-gymnastics.org. Retrieved 30 August 2012. 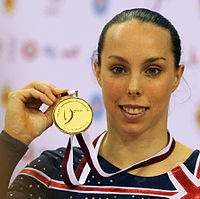 ^ "Cheshire gymnast Beth Tweddle honoured with MBE". BBC News. 22 May 2010. Retrieved 1 September 2012. ^ "International Gymnast Magazine Online – Tweddle Readies for Two-Title Defense". Intlgymnast.com. 7 April 2011. Retrieved 1 September 2012. ^ "4th European Artistic Gymnastics Individual Championships Results Book" (PDF). Berlin, Germany: European Union of Gymnastics. 10 April 2012. Retrieved 27 August 2012. ^ "British Teams Results" (PDF). Guildford, United Kingdom: British Gymnastics. 22 May 2011. Retrieved 28 August 2012. ^ "WAG British Championships Senior Uneven Bars Final Results" (PDF). Liverpool, United Kingdom: British Gymnastics. 10 July 2011. Retrieved 28 August 2012. ^ "WAG British Championships Senior Floor Final Results" (PDF). Liverpool, United Kingdom: British Gymnastics. 10 July 2011. Retrieved 28 August 2012. ^ "43rd Artistic Gymnastics World Championships Results Book" (PDF). Tokyo, Japan: Fédération Internationale de Gymnastique. 16 October 2011. Archived from the original (PDF) on 31 May 2013. Retrieved 27 August 2012. ^ "Artistic Worlds – 7th for Beth in floor final". British-gymnastics.org. Retrieved 28 August 2012. ^ "5th FIG Artistic Gymnastics Challenge Cup Women's Uneven Bars Final Results" (PDF). Doha, Qatar: Fédération Internationale de Gymnastique. 29 March 2012. Archived from the original (PDF) on 28 July 2013. Retrieved 27 August 2012. ^ "2012 WAG Europeans – Team announcement". British-gymnastics.org. Retrieved 30 August 2012. ^ "WAG British Championships Senior Uneven Bars Final Results" (PDF). Liverpool, United Kingdom: British Gymnastics. 24 June 2012. Retrieved 27 August 2012. ^ "18 gymnasts selected to Team GB for 2012 Olympics". British-gymnastics.org. Retrieved 28 August 2012. ^ "Gymnastics Artistic Women's Team Final Results" (PDF). London, United Kingdom: Fédération Internationale de Gymnastique. 31 July 2012. Archived from the original (PDF) on 2 December 2013. Retrieved 27 August 2012. ^ "Gymnastics Artistic Women's Uneven Bars Final Results" (PDF). London, United Kingdom: Fédération Internationale de Gymnastique. 6 August 2012. Archived from the original (PDF) on 22 October 2012. Retrieved 27 August 2012. ^ "2012 Olympic Games – Bronze for Beth". British-gymnastics.org. Retrieved 28 August 2012. ^ "Athletes :: Show". Fig.lx2.sportcentric.com. 25 April 2000. Archived from the original on 27 March 2012. Retrieved 28 August 2012. ^ "Louise Giblin body cast sculptor". Wikimedia Commons has media related to Elizabeth Tweddle.